Teradata (NYSE: TDC), a leading analytics solutions company, today announced Teradata Everywhere™, an industry first that brings the world’s most powerful massively parallel processing (MPP) analytic database to multiple public clouds, managed cloud, and on-premises environments including Amazon Web Services, Microsoft Azure, Teradata Managed Cloud, VMware® virtualization software, and the Teradata IntelliFlex™ platform. As companies move toward hybrid cloud architectures, Teradata is leading the industry by offering customers choice and ensuring database compatibility across deployment modes. Teradata Everywhere delivers the flexibility to implement a hybrid architecture with a common database that enables shifting of workloads between environments as business needs evolve, supporting a company’s changing deployment strategy and economic needs. To deliver optimal performance and flexibility across these deployment options, Teradata is enhancing core features of the Teradata Database. The newest MAPS architecture will provide elasticity to seamlessly expand or shrink a Teradata data warehouse to scale alongside changing business needs. MAPS will also provide higher concurrency and more consistent performance of tactical queries. AdditiTonally, the Teradata Database’s Adaptive Optimizer will automatically adjust to its host environment to provide the most efficient query plans, fastest query execution, and the most efficient system utilization. Teradata Database, already available on AWS Marketplace in nearly a dozen geographic regions around the world, is now available in a massively parallel processing configuration, scalable up to 32 nodes. The latest iteration of Teradata Database on AWS includes powerful performance, reliability, and convenience updates including: automatic node failure recovery; backup, restore, and querying of data in Amazon Simple Storage Service (S3); and one-click deployment automation via software ecosystem launch templates. Teradata Database on AWS is available now in all regions except AWS GovCloud, South America, and China. 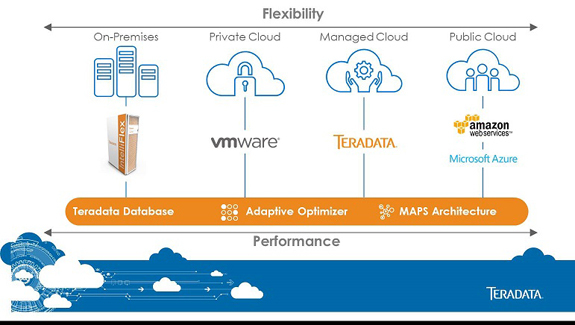 Teradata Database will be available for the first time on Microsoft Azure Marketplace, giving customers the choice of full Teradata Database capabilities on-demand and on a pay-as-you-go basis. Coming soon to Azure Marketplace, Teradata Database on Azure will offer full features and a massively parallel processing configuration, scalable to up to 32 nodes. Teradata Database on Azure is targeted to be available in most regions in Q4, 2016, except US Gov Iowa, US Gov Virginia, West India, and China. In addition to being served from Teradata-provisioned data centers in the United States, the Teradata Database is now available in the Teradata Managed Cloud in Europe, hosted on data center infrastructure in Germany. Monitored and overseen by dedicated Teradata experts, Teradata Managed Cloud allows customers to focus on analytics and business insight rather than on IT infrastructure management. Target availability in Europe is Q3, 2016. Teradata Virtual Machine Edition (TVME) delivers the full-featured Teradata Database in a preconfigured, ready-to-run virtual machine image for any company’s VMware environment. Companies can utilize their existing virtualization infrastructure to deploy a Teradata data warehouse on up to 32 virtual nodes. TVME comes with flexible licensing terms which allow companies to scale configurations up or down as requirements change, even employing multiple instances for special purposes such as test or development. Target availability is Q3, 2016. IntelliFlex is available now, with new features targeted for Q4, 2016. Targeted availability is Q2, 2017. The Teradata Database’s optimizer has long been heralded by customers and analysts as the gold standard for optimizers. Beginning in Q2, 2017, the Optimizer feature will be enhanced with in-stream query re-planning which modifies query steps during query execution using actual versus estimated results. New, adaptive platform-specific costing will recognize and adapt to the host platform, enabling Teradata Everywhere to deliver optimized, platform-specific performance. Teradata Everywhere™ works in tandem with Teradata Borderless Analytics to power business transformation and new business models. The various Teradata Everywhere™ product enhancements announced today will become generally available beginning in Q3 2016 through Q2 2017. A new blog on Teradata Everywhere™ by Oliver Ratzesberger is posted here. The Teradata Borderless Analytics press release can be accessed here.